Oh, hello there. It’s been a while since I posted anything on this blog, I know. It’s been since August, you say? Seems like time has been going by very quickly. In truth I’ve been very busy at work, and I’ve been feeling a bit overwhelmed. Lucky for me I recently took a few trips to the Chinese food courts in Flushing, where I got some really amazing food. Here’s the best of what I had during my recent trips. At the Golden Shopping Mall, a warren of narrow stalls with almost no English menus, I got the bowl of food you see above from what I think is the Chengdu Heaven stall. I got two different dishes — cold strips of cooked potato, seasoned with vinegar and chilies, and a seaweed salad dressed with vinegar and sesame oil. I know, I’ve written about how much I love Spicy & Tasty before. On a recent visit with my friends Jeff and Eva, that love was cemented with a variety of their cold salads. As my friend Jeff said, ordering salads at a Chinese restaurant might seem strange, but at Spicy & Tasty it’s the way to go. 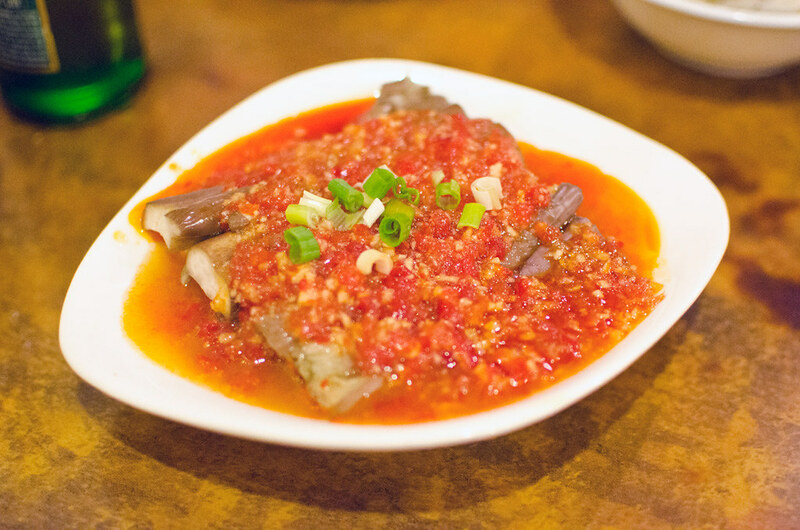 Above is the eggplant in garlic sauce; cold, silky eggplant in a sweet and spicy sauce. Cold eggplant? It works, trust me. The bamboo shoots were excellent as always, as was the dry bean curd with celery. Chewy strips of baked tofu with crunchy strips of Chinese celery, tossed with a sauce that contains the floral aroma and numbing power of Sichuan peppercorns. So a lot of people have been writing about Han Dynasty, the beloved Philadelphia Chinese food empire that has made its way here to NYC. I stopped by for lunch on a recent weekday, to see if it was worth all the hype. I ordered two of my favorite dishes: spicy crispy cucumbers and ma po tofu (minus the pork). They were both excellent, and wonderfully spicy. 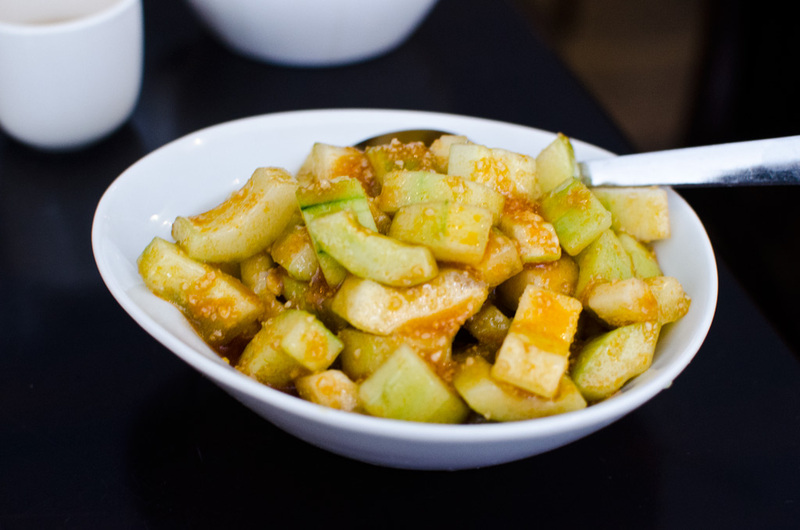 The cucumbers were crisp as advertised, and drenched in a garlicky spicy oil. The spice of the cucumbers was different from, and complimentary to, the spiciness of the ma po tofu. In addition to chili oil was a ton of mouth-numbing Sichuan peppercorns. It was not quite as flavorful as my current favorite ma po tofu, but it was still quite good. 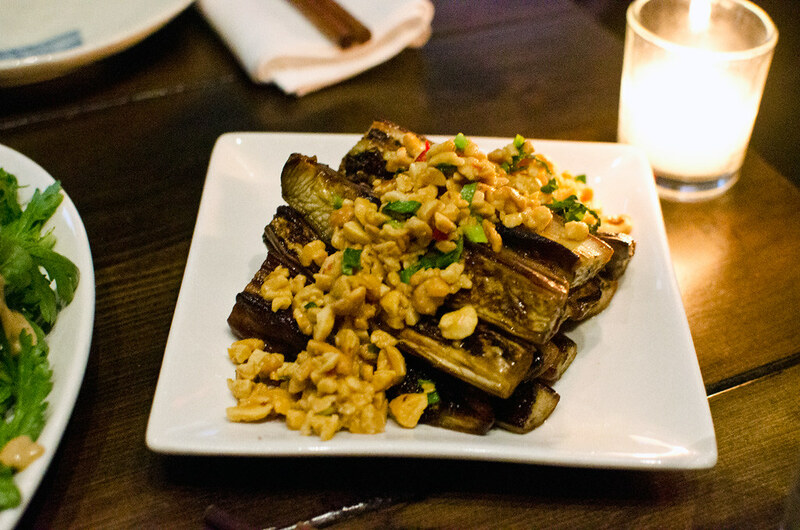 I think Han Dynasty is a great addition to the East Village scene, and I’m looking forward to going back. As I mentioned when I wrote about Full House Cafe, there are more opportunities to explore regional Chinese cuisines than ever before. One such opportunity is at Yunnan Kitchen on the Lower East side, where they feature the food of… yes, Yunnan province. That’s where I met up with Jess & Garrett for a recent dinner. Yunnan is one of the southernmost provinces in China, and shares a border with Myanmar, Laos, and Vietnam. Some of the food at Yunnan Kitchen does indeed share some of the characteristics of Southeast Asian cuisine, particularly the dish called Charred Eggplant. Here the wedges of soft eggplant are covered in a pile of chopped peanuts and cilantro, missing only a squeeze of lime to make it something that could be mistaken for Vietnamese. The Mushroom Rice Cakes seemed like more standard Chinese-American fare, overly sweet, but the Chrysanthemum Salad was more interesting. 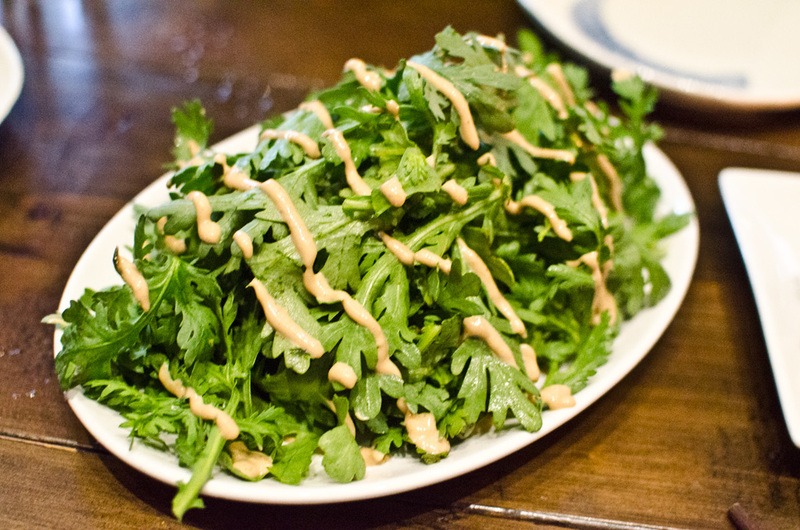 The chrysanthemum leaves were herbal and slightly spicy, while the dressing provided a tangy, sesame counterpoint. It also tastes wholly original, which is exactly the kind of thing I’m looking for when trying new cuisines. Yunnan Kitchen — 79 Clinton St. 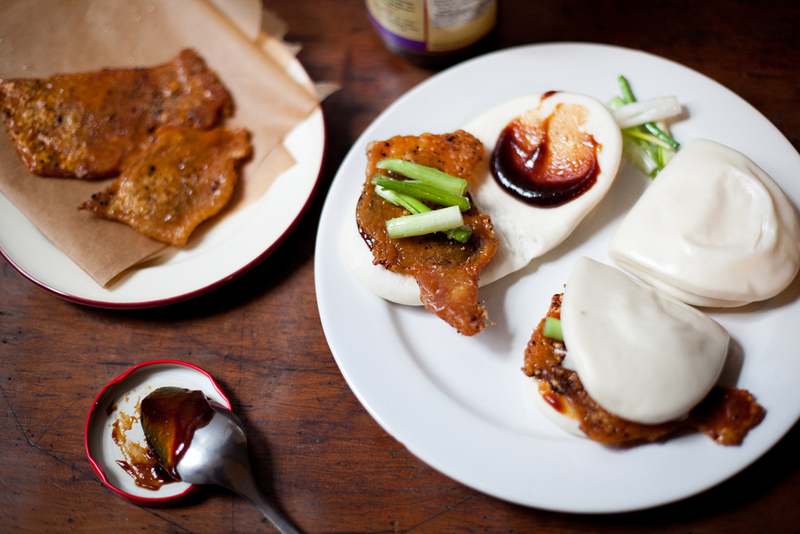 There are so many regional Chinese cuisines that it’s hard to keep up. Some, like Sichuan and Cantonese, I feel like I’ve got a pretty good handle on. Others are becoming more familiar; the food from Shaanxi province is becoming more familiar thanks to the Xi’an Famous/Biang! family of restaurants, and Fu Run was a nice introduction to the food of the northern Dongbei region. Shanghai-style food is something I was not familiar with, but when I read this article over on the Village Voice blog, I figured it was time to get acquainted. My parents took me for my birthday, and the cold appetizers were really the highlight of the meal. My favorite was the Kao Fu Shanghai Style, above. The waiter described it as “tofu in a black sauce,” but it’s actually a wheat gluten product. The sauce was an intriguing mix of salty and sweet, and the chewy wood ear mushrooms and the crunchy peanuts added an interesting textural contrast. The fact that it was served cold made it even more unusual, in a good way. 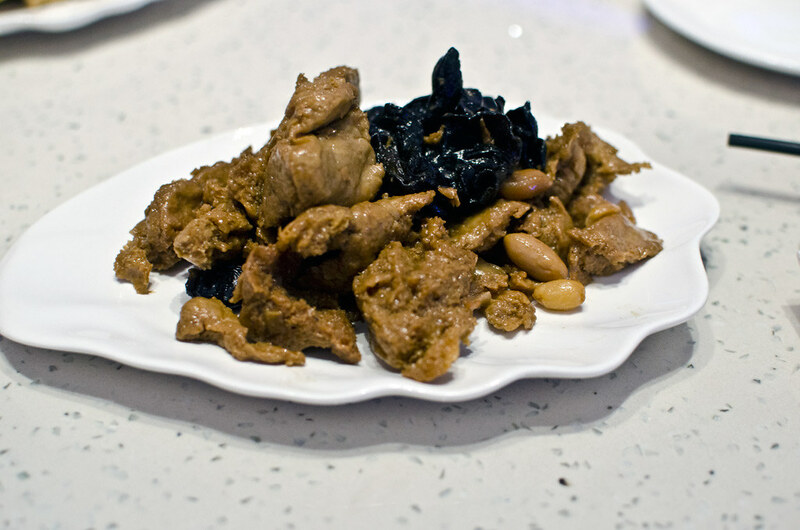 Also good was the Vegetarian Mock Duck; a chewy bean curd skin wrapped around chopped mushrooms, also served cold. 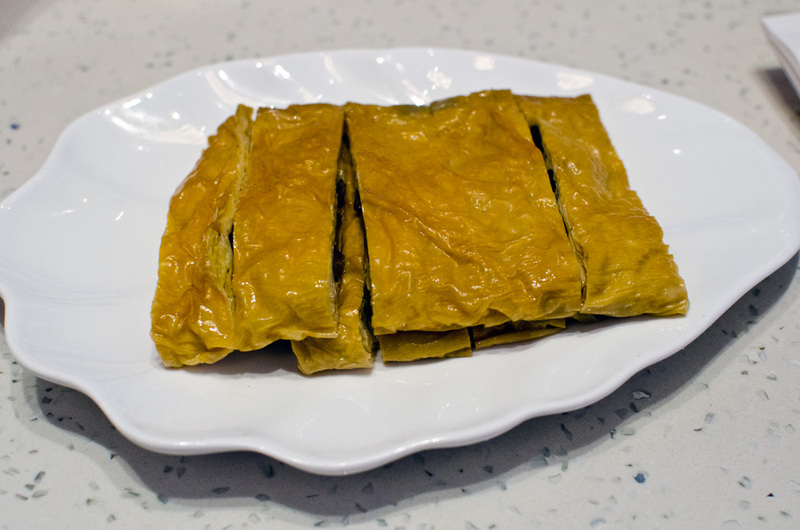 The Scallion Pancakes and the Ma Po Tofu were more familiar, and less interesting dishes, and contributed nothing to my knowledge of Shanghai cuisine — but that’s my own fault for ordering them. 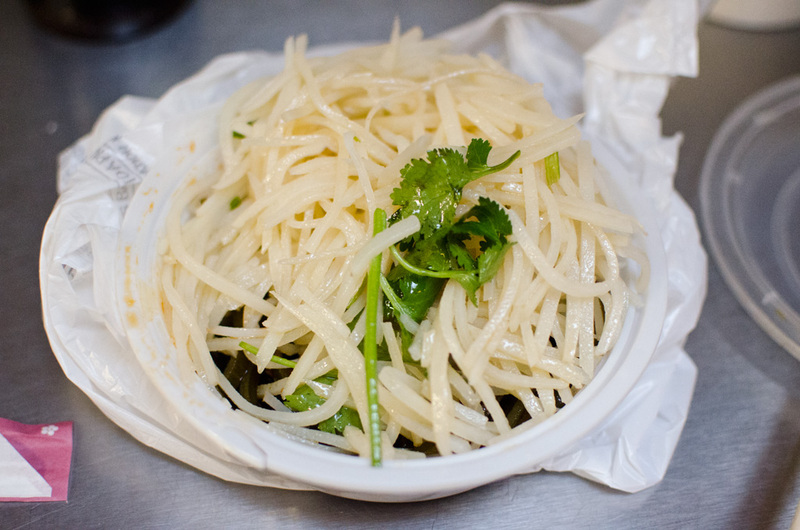 Sure, the place is called Tasty Hand Pulled Noodles, but on a recent visit I had the knife cut noodles. 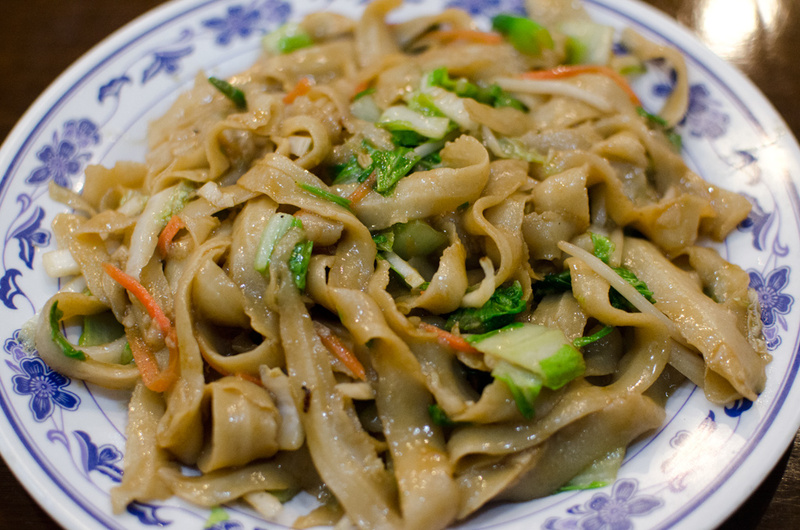 If you’re not familiar with the technique, they take a big hunk of dough and use a knife to slice off thin, ragged noodles of various lengths and thickness. Since each noodle is unique, you never know what you’re going to get. I got them fried, instead of in a broth, which this type of noodle I think is the right way to go. Less interesting were the cucumbers in vinegar, which were surprisingly bland — they can’t hold a candle to the ones we had at Biang!